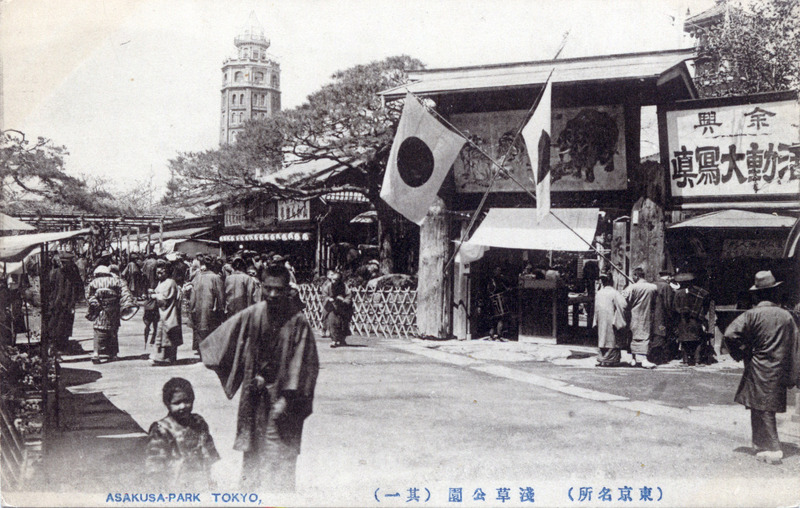 Hanayashiki, Asakusa Park, c. 1920. Hanayashiki Garden, at Asakusa Park, Tokyo, c. 1920. “In my childhood, the admission at Hanayashiki was five sen for an adult, two or three sen for a child [one sen was 1/100 yen]. In the spacious grounds where I went to play were mounds, artificial waterfalls, and a large red higoi [decorative fish of various colors, related to carp] swimming in the pond. In cages, here and there, were monkeys, foxes, pheasants, and peacocks, making that corner of the grounds a small zoo. “On a small stage just beyond the zoo area, a well-trained blue titmouse walked a tightrope while carrying a prophesy written on a piece of paper in its bill. I never tired of watching its unvarying movement. The puppet theater next to the bird’s stage was always crowded with children. Plays based on such fairy tales as Momotaro [‘The Peach Boy’], ‘The Monkey-Crab Fight’, and ‘The Sparrow Whose Tongue Was Cut’ were presented with puppets smaller than those in Bunraku shows. Children screamed with horror when, by some contrivances, one-eyed fiends and paper-umbrella monsters rose slowly from a large wicker basket. Entrance to Hanayashiki, at Asakusa Park, Tokyo, c. 1910. The Twelve-Storeys tower stands tall in the background. “Then you come to [Asakusa] park, laid out in 1885 as a recreation ground for the people. On one side is the Hanayashiki, originally a flower garden but now much more of a zoo, while over against the Hanayashiki is the fishpond teeming with goldfish, with a tea-house and a bridge, and in summer an arbour of trailing Wistaria beautiful to look upon. “Beyond the lake on one side is the Aquarium; on the other the great Theatre Street, with its row of ‘Dime Shows’ where you can see a constant succession of feats of jugglery and acrobatic performances. Archery, which is always a favourite pastime with the Japanese, has a special corner for itself, and, if you are fond of exercise, you may climb to the top of the twelve-storied tower, from which you can get a very comprehensive bird’s-eye view of the whole city. 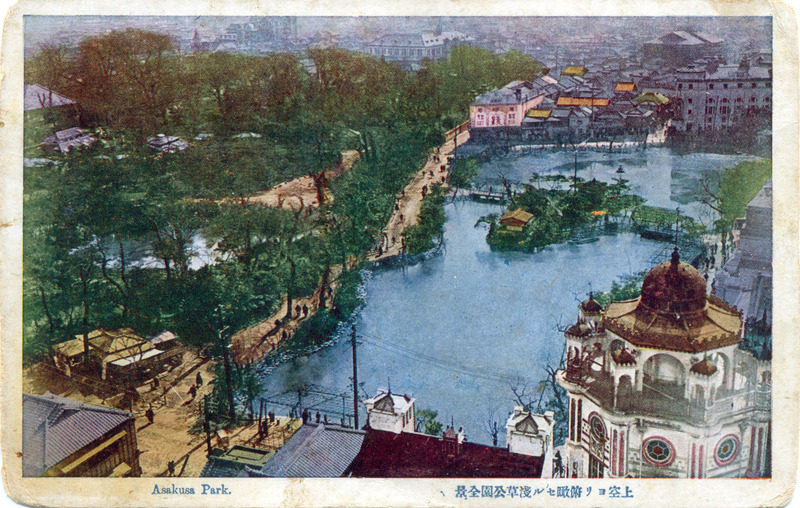 Elevated view of Hanayashiki (left) and the Gourd Pond, from atop the Twelve-Storeys Tower, c. 1920. 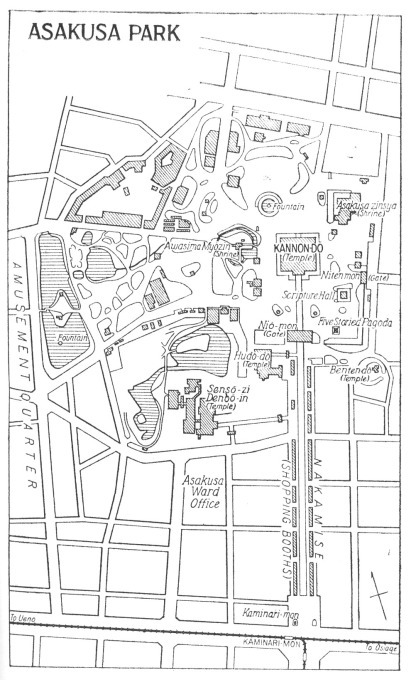 Map: Asakusa, showing the temple grounds (right and center), Hanayashiki (upper left), Asakusa Park (center-left), Theater Street (left), and Nakamise (lower right). From the wiki: “Hanayahiki has operated since 1853. Once the Meiji era opened Japan up to the world, the little park lost its original elegant and formal nature, growing into a showplace for novelties and exhibitions. 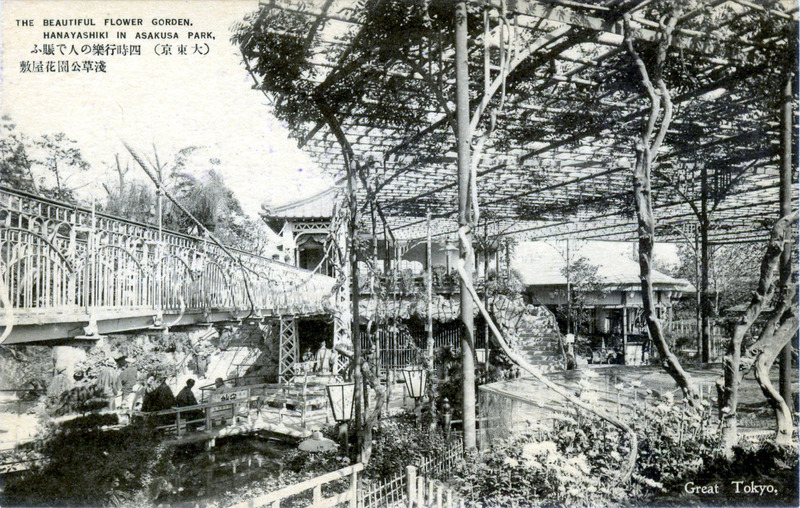 The park offered a curious public animal exhibits, acrobats, and the earliest motion pictures exhibited in Tokyo. Its identity as a fun fair may have begun with the addition of a merry-go-round. Throughout the Meiji era, it continued to amuse and amaze, tucked away between a couple of alleys adjacent to the Senso-ji temple and the Asakusa shrine. Its proximity to famed Senso-ji has made Hanayashiki a visible curiosity to shrine visitors and tourists, alike. “In the post-WWII years, Hanayashiki has established itself as a popular (but small) amusement park, catering mostly to local families, especially those with young children. The park’s footprint has grown smaller, but new attractions have steadily been added, creating an unusual multi-layered effect, in which the park has had to grow vertically in order to expand.Many other regional and neighborhood amusement parks in Japan were shut down by the late nineties, but Hanayashiki has managed to carry on, however humbly, in its tiny corner of Tokyo.